Yesterday, I called into my favorite radio show--The Catholic Guy Show on Sirius 159/XM117 and competed in a little game show, "Let's Make a Catholic Deal." In the show, you are asked a question regarding Catholicism. The question may be about church fathers, the liturgy or the Bible. If you get the question right you are given a prize. You can either choose to keep that prize or pick door #1, #2 or #3. Two of the doors have good prizes behind them such as rose scented rosaries blessed by the pope, prayer cards, or the coveted pope bottle opener. The third door is a boobie prize. You could get stung by bees, attacked by a boar or hung up on. After some witty banter, Lino asked me to name two of the first five popes. My answer: St Peter and St. Linus. I was even able to throw Clement in there for good measure. I'm not incredibly smart. The fact I knew the answer says something about the show in which you have fun and helps you learn your faith without even realizing it. I was thinking later about how amazing is it that today, in 2009, I am a member of a Church led here on Earth by Pope Benedict XVI. He is the 265 successor to St. Peter. Yes THAT St. Peter. The guy in the Bible. And he was put in this position by Jesus when He said in Matthew 16: 18-19: "And so I say to you, you are Peter, and upon this rock I will build my church, and the gates of the netherworld shall not prevail against it. I will give you the keys to the kingdom of heaven. 14 Whatever you bind on earth shall be bound in heaven; and whatever you loose on earth shall be loosed in heaven." We believe that Jesus intended there to be a visible church here on Earth led by Peter and the first apostles and that they would be succeeded by others. We believe that this Church would always be guided by the Holy Spirit. Through 2000 years, men have succeeded Peter and the rest of the 12 apostles as Pope and Bishops. These successors have shown their humanity that's for sure. Oh boy--we've had some bad popes and we have had bishops who were real bastards. But in the end, no matter how bad they were--how many girlfriends they messed around with or no matter how spoiled they were in their wealth--they never changed any theological truths of the Church. Because of that the truths that the Catholic Church proclaims today are the same truths that it preached 2000 years ago. Some may say that the Church is old fashioned and needs to get with the times. In the end, even though society changes, truth does not. 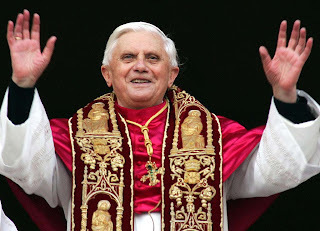 So today, the universal church is led by Pope Benedict XVI. My home diocese of Kansas City-St. Joseph is led by Bishop Finn and these men are both successors to the original 12 apostles. There is something calming in that. You may be wondering about my prize. I won "Saint Book" by Mark Hart--the Bible Geek. I was hoping for either a Mark Hart book or a DVD of Generation Cross so I took the book. If I would have picked a door I would have won a rose scented rosary blessed by the pope. That's okay--I'm happy with my book and it beats a glass of Haterade.